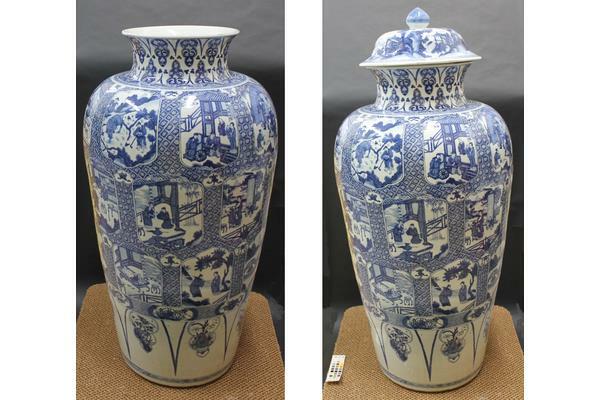 Back in March 2015, I wrote a blog post about the treatment of a Chinese export porcelain blue and white soldier vase and lid from the Kangxi Period. I am now extremely pleased to post the sequel to show you the completed project. During treatment, a time record sheet and a description of treatment were kept in order to supply the owner with an exact schedule of the project. 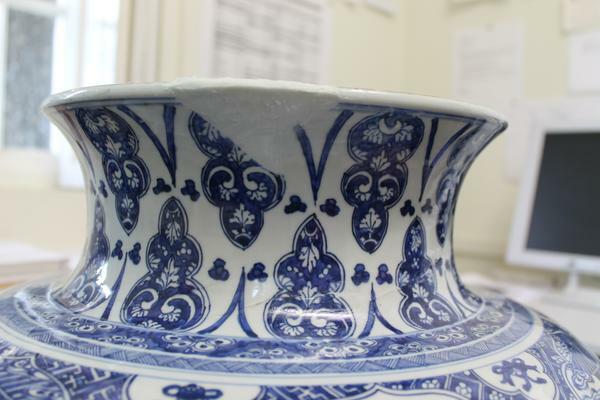 It has been an immense pleasure to work on such a challenging, historically important and decorative object. 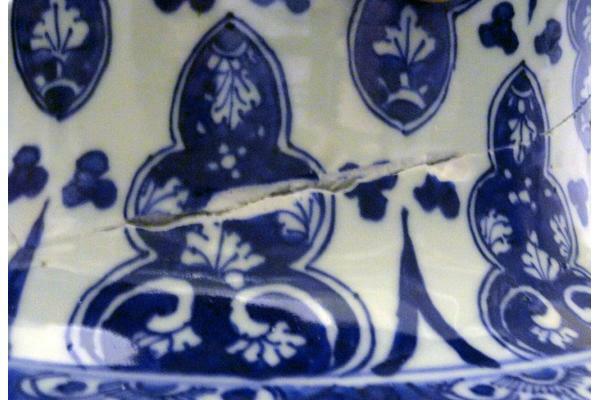 To bond the vase shards a dry run was carried out to locate the small fragments of blue and white glaze along the break edges (Figure 1). Along with the larger shards, an assembly order was created. All the shards were degreased thoroughly with cotton wool swabs of acetone. 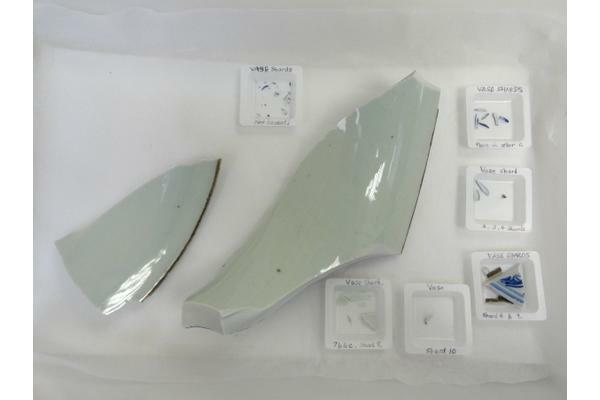 Following the bonding plan, all the shards were placed onto the vase supported with Magic™ Tape (Figure 2). The small fragments were carefully positioned and held with thin strips of Magic Tape; this needed precision for a successful arrangement. Figure 1: Areas of loss along the break line. Figure 2: Vase shards prepared for bonding. Fynebond® epoxy resin adhesive was introduced with a cocktail stick along all the joins, drawn in by capillary action once I was happy with the placement of all the shards. 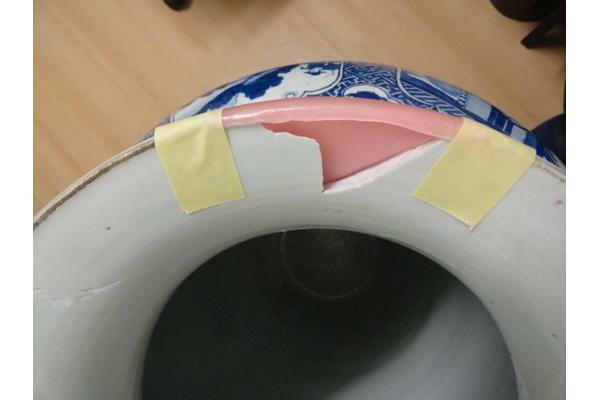 After 48 hours of curing and then removal of the tapes, the vase was tapped with a knuckle; the vase gave a clear ringing sound identifying the successful bond. A Kemdent® Anutex modelling wax support was made for the largest area of loss (Figure 3). 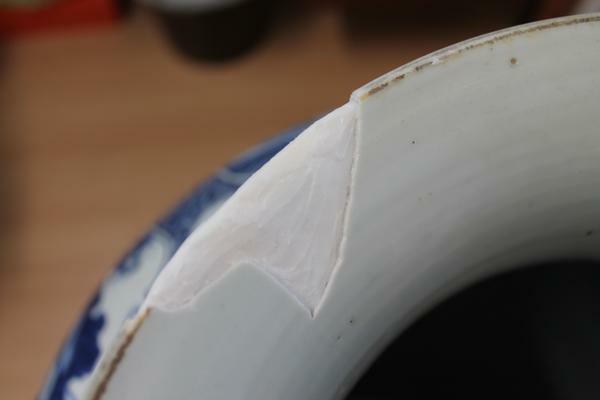 Plaster was used as the first core fill as the porcelain around the rim is extremely thick and the fill would, therefore, use large amounts of material if it was made purely from an epoxy adhesive. Figure 3: Modeling wax sheet in place for application of the plaster core fill. 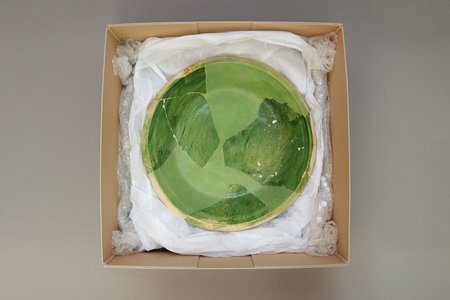 On the lid, the glaze decoration layer was replicated using Fynebond bulked with CAB-O-SIL® (fumed silica) and dry powder pigments. 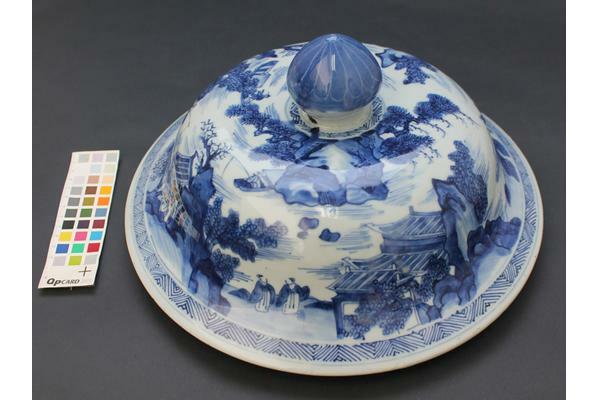 Once the colour filling had cured on the lid after 48 hours, the fill surface was sanded and burnished with varying grades of Micro-Mesh (abrasive cloth). 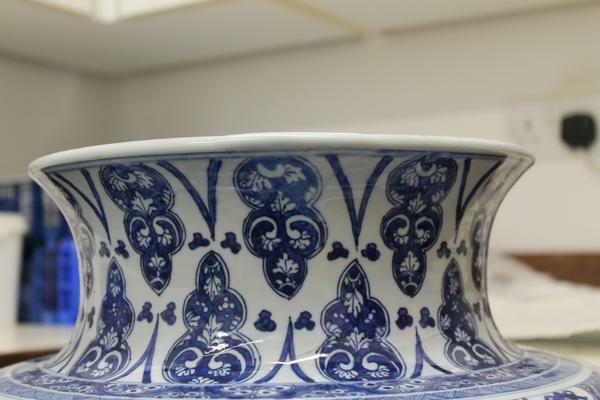 To fill the large area of loss to the interior foot ring of the lid (where it rests on the vase) a mould was taken from the original part of the ceramic. Using wax sheets, a hair dryer was used to soften the wax sheet for it to be moulded to the lid to achieve a tight and detailed impression (Figure 4). Figure 4: Before the replacement of lost material. 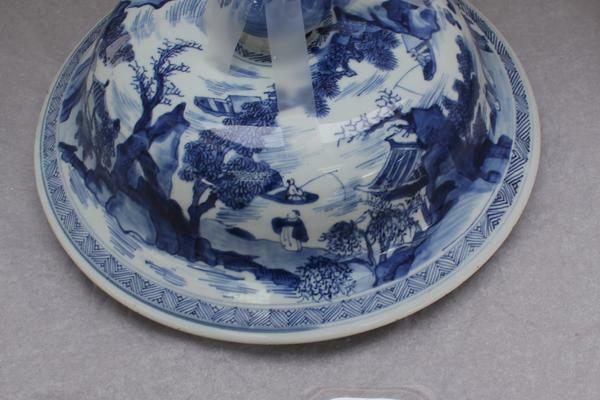 The wax sheet was taped to the sides of the ceramic with masking tape. 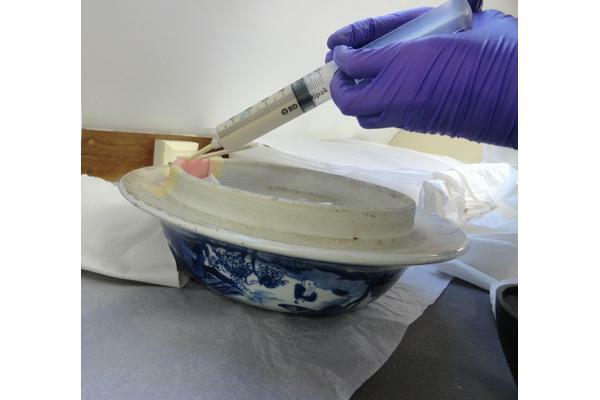 To securely attach the wax sheet to the ceramic, and prevent plaster escaping from the mould, a heated spatula was used to seal the wax. Tiranti Lafarge Prestia Plaster Basic Alpha was chosen due to its hard casting characteristics; it would be able to pick up a better definition from the mould and could be sculpted. 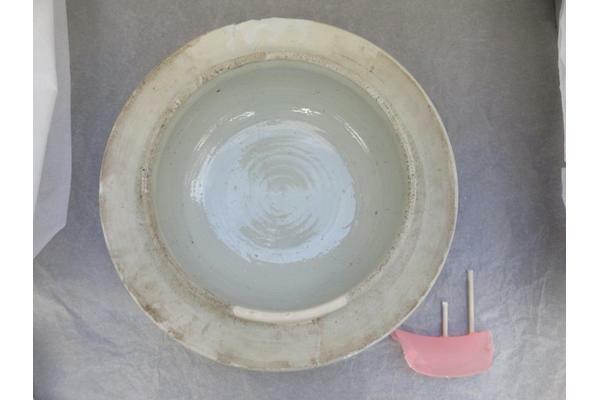 Drawing from the bottom of the bowl, a syringe drew up the plaster. Balancing the nozzle of the syringe on the smaller straw, the plaster was injected slowly into the mould (Figure 5). Once fully cured the wax sheet was removed, uncovering a perfectly cast area (Figure 6). Figure 5: Syringing the plaster into the mould. 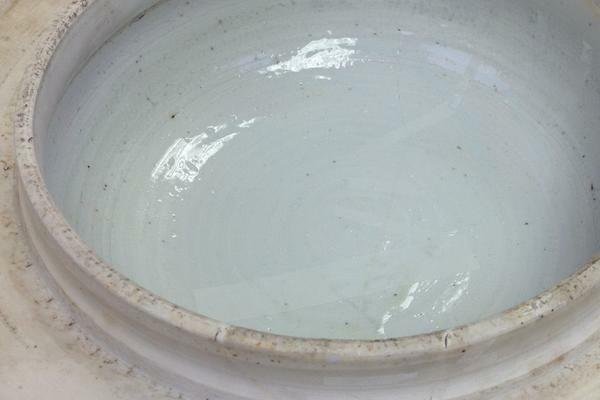 Figure 6: The lid after moulding and filling showing a complete rim. For the vase core fill, Fynebond was mixed with CAB-O-SIL, glass bubbles (hollow glass microspheres) and various dry powder pigments. The fill material was spatulated on top of the plaster fill and levelled out neatly around the break edges to allow room for the glaze colour and retouching to be applied. This core fill built up the majority of the shape to the rim (Figure 7). Figure 7: The core fill to the vase rim. To retouch the plaster fill to the lid, layers of GOLDEN® Fluid Acrylics and AKADEMIE® Acrylcolor blocked out the bright white of the plaster to colour match to the ceramic (Figure 8). Acrylic paint was dabbed on the rim fill to achieve the speckled 'dirty' appearance to blend in with the original. Professional photographs were taken before the knop was adhered, in order to capture the complete shape of the lid (Figure 9). Figure 8: Retouching the plaster fill on the lid. Figure 9: The finished interior of the lid. To bond the knop, all exposed break edges were degreased thoroughly using cotton wool swabs of acetone. It was positioned and secured into place with strips of Magic Tape, then Fynebond was introduced to the break lines with a cocktail stick (Figure 10). Figure 10: Bonding the knop. 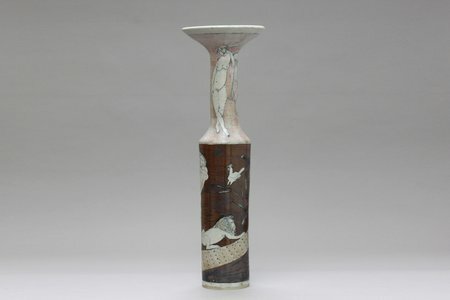 The body glaze colour for the vase was replicated using Fynebond, CAB-O-SIL and dry powder pigments. The fill material was neatly spatulated over the core fill and left to cure (Figure 11). The vase fill was sanded with Micro-Mesh prior to application of the decoration. 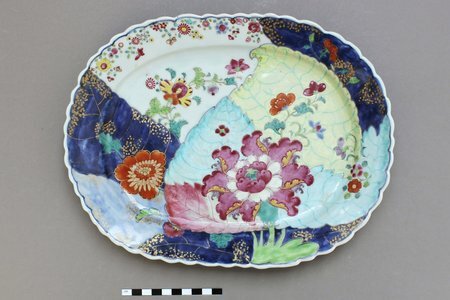 Figure 11: Body glaze colour achieved before applying the decoration. Tracing paper copied the design onto the fill area to guide where the colours were to be added (Figure 12). For the decoration, pigmented liquid Fynebond and slightly bulked with CAB-O-SIL was applied with a paint brush, dipped in acetone for smooth application. A light layer was applied first and then gradually built up darker (Figure 13). Figure 12: Design of the decoration traced onto the fill. 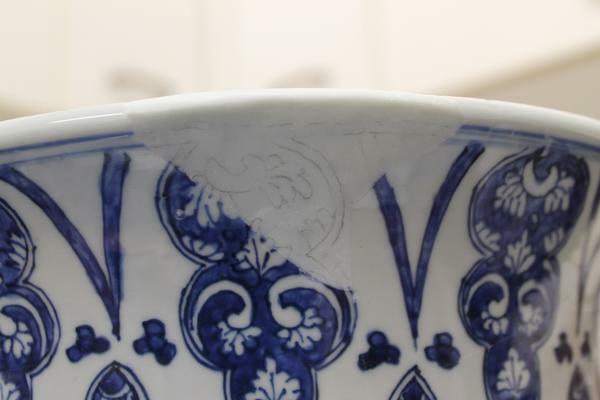 The final stage of treatment for the object was to retouch the filled missing areas to the line around the rim of the vase. 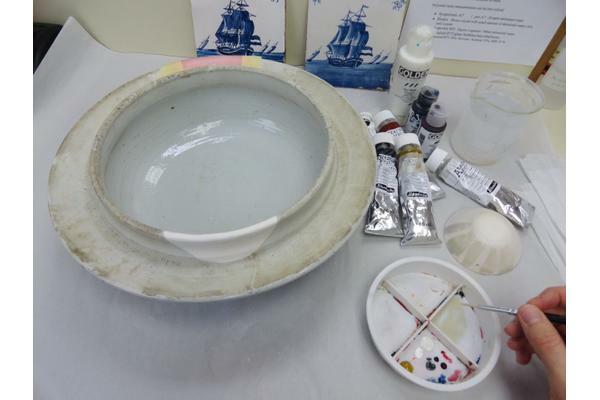 AKADEMIE Acrylcolor acrylics including Vandyke brown, Graphite and Sand were mixed to Stevenson Burnt Umber dry powder pigment and pumice. 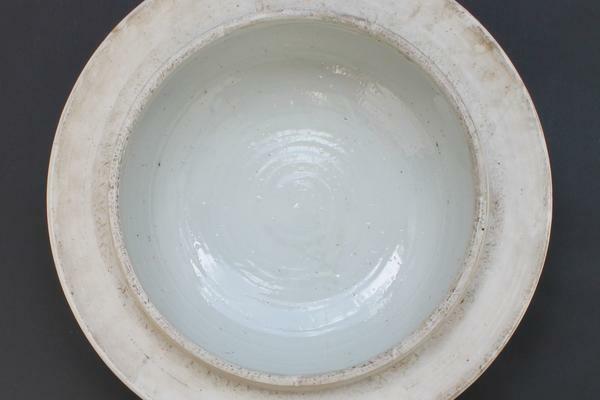 The pumice gave a granular feel to achieve the texture of the unglazed ceramic. Using a paint brush, the colour was matched and applied to areas of loss; this brought the eye to view the vase as one entire piece. Cue the drum roll…the vase and lid were photographed upon completion of treatment (Figures 14-16). Thank you for reading! Figure 16: The completed lid after treatment.